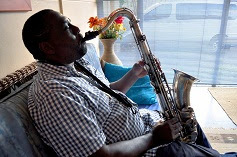 Action in Autism hosts a fundraising afternoon of smooth jazz, coffee and books with Mfana and Quartet this Saturday (May 26) from 14h00 to 16h00 at their new premises in Durban North. Action in Autism provides early intervention for 32 children under the age of six, and also provides a free walk-in resource and support service, a free diagnostic clinic, and regular support group meetings for families of people with autism. For this afternoon of fundraising and community, legendary saxophonist Mfana Mlambo will be accompanied by Neil Gonsalves on piano, Blessed Twala on bass and Bruce Baker on drums. Tickets R150 available from the Action in Autism office, or at the door. Refreshments and light snacks are on sale, and guests are welcome to bring their own sundowners. All proceeds go to ensuring the continuation of Action in Autism’s Early Intervention Centre. Action in Autism’s premises are situated at 105 Haig Road, Parkhill, in Durban North.